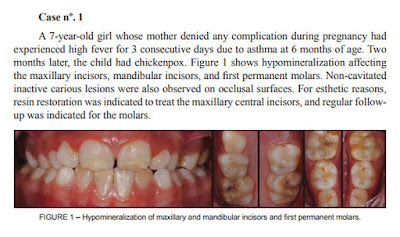 Molar incisor hypomineralization (MIH) is defined as a developmentally derived dental defect that involves hypomineralization of one to four first permanent molars (FPM) and is frequently associated with similarly affected permanent maxillary and mandibular incisors. 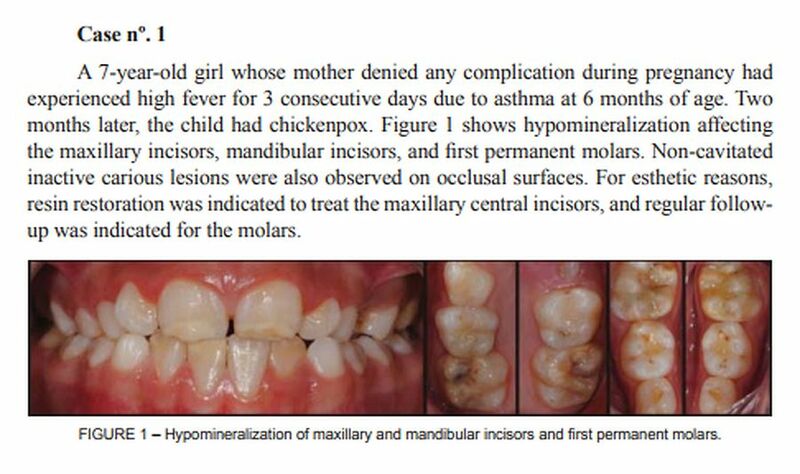 Clinically, MIH may present as discrete, opaque lesions, ranging from white to yellow-brown, distinct from the more diffuse linear opacities usually observed in fluorosis. MIH may be associated with post-eruptive enamel loss, making it potentially difficult to distinguish from enamel hypoplasia. Affected teeth can present high sensitivity to temperature variations and tooth brushing, even when the enamel is clinically intact. MIH may co-occur with many dental problems, including fast development of carious lesions and repeated need for dental treatment. The condition has also been referred to as a risk factor for dental caries in populations with a low prevalence of this problem. Different prevalence rates have been reported for MIH in various areas of the world, ranging from 2.5 to 40.2% 7-10. In Brazil, the prevalence of MIH is considered high, varying from 19.8 7 to 40.2% 10. These figures underscore the importance of better investigating this type of defect. Despite of the multifactorial etiology of hypomineralization, systemic conditions are known to be usually involved. Several factors have been related to the origin of MIH, e.g., problems during pregnancy, pre-term delivery, cyanosis, diseases in early childhood (e.g., chickenpox, otitis, urinary infections, and tonsillitis), high fever, gastrointestinal disorders (e.g., celiac disease), and the frequent use of antibiotics. The relevance of each event is difficult to establish, as many can happen more than once in early childhood. Also, the literature refers to the first years of life as a critical period for crown formation of FPM and incisors, and therefore more likely at risk for MIH.